I left Sallie Keys Lakes yesterday; rested, relaxed and ready to tackle Selden Pass. The soft pine-needled trail meandered along the lakeshore I’d called home for two nights, leading me north toward the pass. 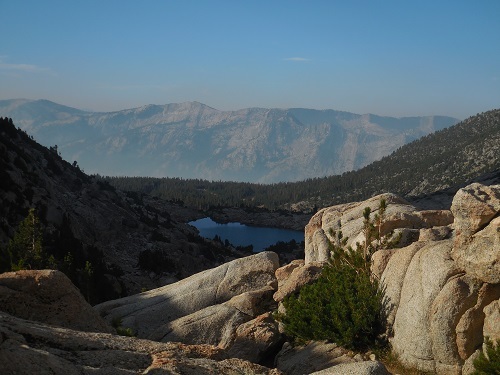 At just 10,880 feet, it was a relatively easy climb, through the now-familiar rocky terrain, sparsely populated with high sierra pines and cool, serene tarns. By ten am I was at the top of the wide pass enjoying a spectacular view of Marie Lake just a few miles to the North. It reminded me of Rae Lakes, with its islands and peninsulas floating serenely atop sapphire blue waters. Once on the north side of Selden Pass, I had a long decent into Quail Meadows. 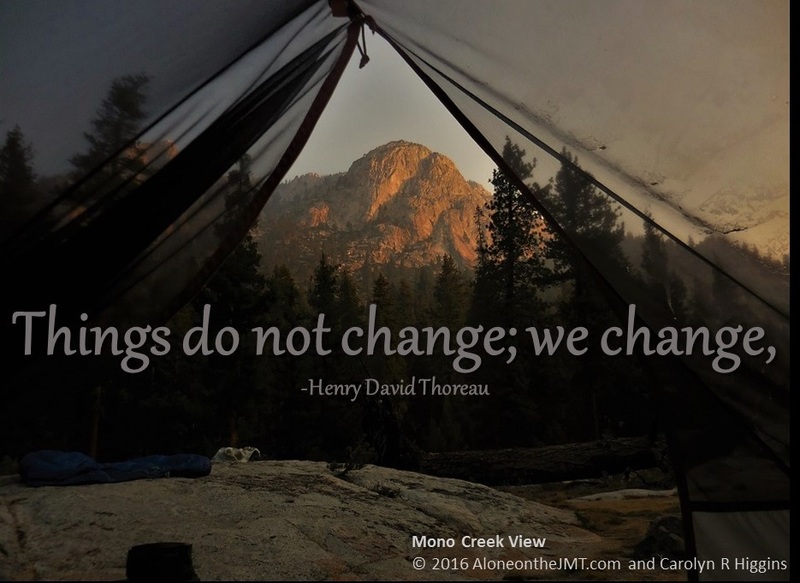 I hadn’t seen a single soul for hours when I stumbled into my camp on the south side of the wooden bridge crossing Mono Creek, near the Vermillion Resort Junction (Mono Creek Trail). Sometimes as I hike, my mind plays tricks on me and I’ll hear voices whispering in the breezy trees or in the echo of waterfalls rushing through narrow gorges. Even bold conversations can be heard swirling from creeks and rivers as their waters splash and gurgle their way around boulders. Like the day of the coyote-kill encounter, the ghostly conversations jolt me to a to a stop. With a skipping heart, I freeze in place, holding my breath. My ears strain to hear what I cannot see: signs of people on the trail ahead or relaxing in the forest nibbling on trail mix. Seeing nothing, I move on, attributing it to another of the forest’s great mysteries. As I surveyed the flat, sandy sites between smooth slabs of rock, looking for the perfect place to call home for the night, waves of discourse wafted toward me as the invisible creek-ghosts carried on their lively conversation, as if I wasn’t even there. I’d stop. Look around. Scan the trail and the boulders for signs of humanity. Nothing. Feeling secure that Mother Nature was in one of her playful moods, toying with my mortal senses, I continued pitching my tent. 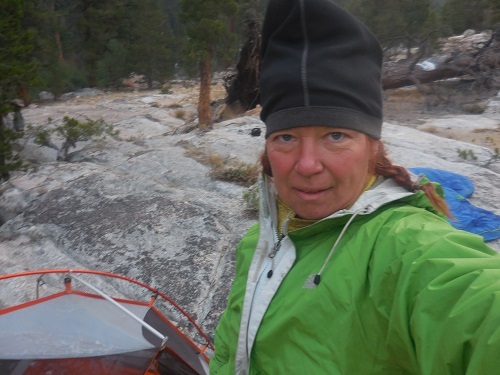 Once it was set up and my bed made, I pulled on my Merino wool base layers, my clean bedtime wool socks and camp shoes and settled in to boil water for dinner. As I rehydrated one of my favorite homemade meals of cabbage, tomatoes and white beans, I listened to the rushing Mono Creek for signs of more ghost talk. I heard nothing but rushing water. I got up and stretched my legs and then wandered around the perimeter of my camp investigating the fallen trees and smooth exposed rocks. 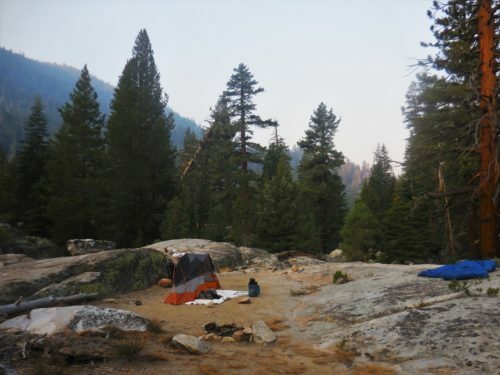 It relaxes me to explore the area I’m camped in, and once I was satisfied I knew what was around me, I settled in to eat my dinner. Exhausted, within seconds of laying down, my eyelids drooped and sleep courted my tired bones. Just as I was about to slip into that blissful comfortable place I heard a man’s voice, just a few feet away from my tent. “Hmmm” I thought, “late-comers. They must be looking for a place to camp.” I couldn’t hear what he was saying over the roar of the creek, but I definitely heard a man’s voice. I laid there on high alert.Waiting for the beam of their headlamp to hit the walls of my tent; it was too dark to pitch camp without light. But the light didn’t come. I heard talking again – this time it sounded like two men. Then it was silent. I laid still in my tent, not breathing. Listening. Nothing. Ok, I must have been hearing things. I relaxed again, determined to not be scared by imaginary voices in the night. It sounded exactly like a bear canister hitting the ground just a few feet from my head outside my tent; Surely, they see me. They can’t be camping right next to me… Can they? I was at least thirty feet off the trail. They’d have had to walk over some nice campsites to get to mine. They must know I’m here. Why would they be right outside my tent? Without lights? I was more curious than scared and started wracking my tired brain: was that my bear can I heard? Is there a bear out there swatting my can around? Then I realized mine was tucked away in the rocks about 10 yards on the opposite end of camp. Silence fell like a hammer on the night and only the roaring creek occupied my camp. No voices, no headlamp. Nothing. I figured my mysterious neighbors had quickly set up and called it a night. Although I couldn’t quite let go of the odd fact that they’d set up without light. “I’ll see in the morning” , I thought. A few hours later, when I went out to go the bathroom, I scanned the dark night for signs of my late-arriver neighbors. My eyes adjusted enough in the dark to see within a few yards of my camp. Nothing. A little puzzled, I went back inside and fell asleep. When I woke up in the morning and exited my tent, the first thing I did was look for my new neighbors. I looked around me, further into the woods, on the other side of the creek; there was no one. I was completely alone. The voices, I chalked up to the sounds of the rushing water or the wind. But the bear can? The sound of heavy plastic hitting rock and dirt? Who knows. Another of nature’s mysteries. (Side note: I now realize it could have been night-hikers passing through. But it still seems odd they didn’t use headlamps, but it’s possible). Well, it looks like Autumn is here to stay in the mountains. I was awake at six am, curled inside my sleeping bag, trying to protect myself from the frigid pre-dawn air and condensation oozing from my tent walls. I’ve discovered that I stay warmer inside my sleeping bag wearing just my base layer, instead of donning every stitch of clothing I own. Last night, I skipped sleeping in my down jacket and instead draped it over my bag (and now it’s damp with condensation). I must be acclimating and learning how to survive out here; a thirty-two-degree night (there’s frost on my tent) and I slept like a baby! 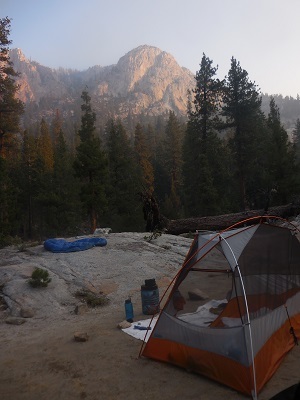 I forced myself out of my cozy trail-bed and into the biting-cold morning as soon as the sun broke the horizon; I wanted to lay my sleeping bag, jacket and tent in the sun to dry, before stuffing them into my backpack. I had to dodge sparkly, bitter-cold frost resting in the shadows of the giant boulders framing my camp as I worked. Very cold at Mono Creek in September! The past few days I’ve been feeling more at home here; missing the conveniences of “normal” life a little less and settling into a routine. Not the hiking so much, that’s always going to be difficult, even John Muir himself probably would have scoffed at hiking fifteen miles a day, covering four thousand feet in elevation with forty pounds on his back. He was smart: a hunk of bread and a blanket. How pampered we are these days! What I mean is, I am feeling more at home, living out here. I have been living in the wilderness for nineteen days! Nearly three weeks! It feels comfortable. It feels like home. The first week was about the adventure of it; the excitement and awe. Week two was Reality: this is hard work, it’s uncomfortable, inconvenient, and tough. Week two was when I started missing home and my every-day life. This past week, I’ve been feeling like I’m settling in. Like I’m acclimating to a new reality: a new world, free from the hustle-and-bustle and stimulus of my every-day life. I feel like I am really learning how to survive – and thrive – in the elements. I’ve learned that I can’t swim every day in the windy chilly conditions and not dry off before putting my hiking pants back on and hitting the trail because it chaps my skin. I realized that hiking longer, and getting into camp later, feels better than stopping early, sitting around for three hours and being in bed out of boredom by seven (that also helps me sleep better). I’ve learned not to be in a hurry to get from point A to point B, but to take my time and enjoy the journey. I’ve learned that I need sugar for instant energy, and when I’m hiking eight to ten hours a day I can eat anything I want! I’ve also recognized that just being out here nineteen days is giving me the experience I came here for: I am really living in nature! The whole reason I decided to take a full thirty days to do this is because I knew it would take a while to shed modern life. Somewhere along the way, I’d forgotten that and started focusing on being done. I think the discomfort got so omnipresent that I just wanted to rush through and finish the trail. But as I see myself settling in and becoming more comfortable being out here, in the wild, alone, I wonder what the end will feel like? And what Home will feel like? Will it feel more like home than it did before I left? Or will I still have the same delusions and fantasies of escaping into the wilderness to live off the land? 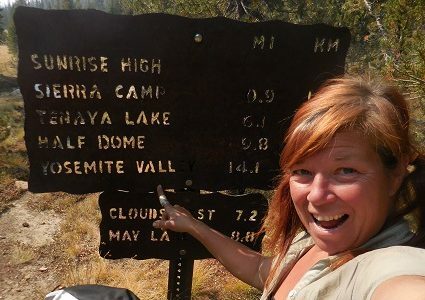 Will this hike cure that thinking or make it more pronounced? Will “home” still feel fake, forced and unnatural? Or will this shatter my philosophies about the ills of modern society and the benefits of returning to the natural world? Will this experience make me more grateful for the comforts of modern living or despise them even more? Will being in nature still feel more real to me or will this experience cure me of my “roughing it” fantasies? As I move into my final week to ten days of my hike, I wonder: what will I experience next? These are the thoughts and questions that rumble through my mind, relaxing and unsettling me at the same time as I pack up my gear to begin my nineteenth day of hiking. Today I climb 10,900′ Silver Pass – my ninth pass! (That means only two to go… that makes me happy and sad at the same time…) I’m getting used to them by now- and they’re lower than the southern passes. So I just trudge on and climb and climb and climb… my goal today is to make it to Tully Hole – and Red’s Meadow in two days!! !